In 1958 the arms race proceeded apace, with the enormous weapons production infrastructure and both weapons labs operating at full speed. Hardtack I included 35 tests, the largest test series so far (1958 in fact saw a total of 77 U.S. tests, more than the three previous record setting years combined). 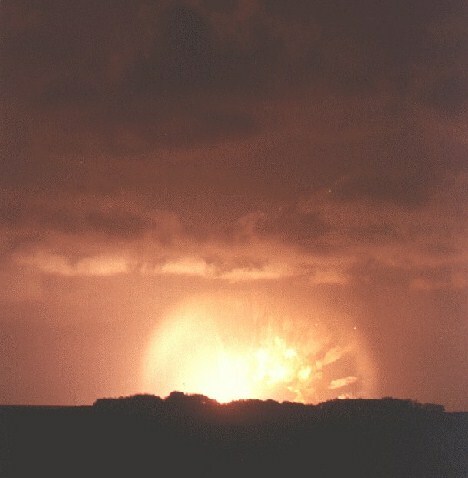 Partly this burst of testing activity was due to building pressure for an imminent test moratorium, leading the weapons labs to rush as many device types to the test range as possible. A total of 35.6 megatons were shot during this series. The lab tests centered on ICBM and SLBM missile warheads and high yield strategic bombs. The DOD conducted high altitude multi-megaton tests to study their usefulness for ABM (anti-ballistic missile) warheads, and discovered the high-altitude EMP (electromagnetic pulse) effect in the process. Effects tests of underwater explosions were also conducted. At least 14 mark-designated warheads were tested, plus additional developmental designs not yet awarded a serial number. These included the Mk/TX/XW - 7, 25, 31, 34, 35, 39, 41, 43, 46/53, 47, 49, 50, and 51. This series fired the largest tests since Ivy and Castle (and never equalled since in later U.S. tests) and led to the development and deployment of the largest U.S. weapon ever fielded, the 25 Mt Mk-41 bomb; and the largest U.S. missile warhead ever fielded, the W-53 9 Mt Titan-II warhead. An air dropped bomb variant of the W-53 was the largest (and oldest) weapon in the U.S. inventory up until its retirement in early 1997. 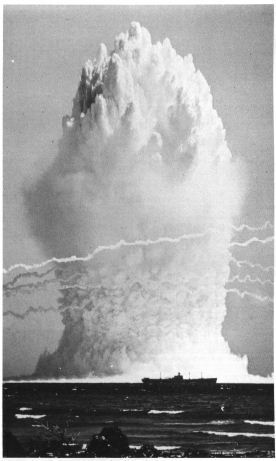 The UCRL test of the W-47 Polaris warhead prototype was a major technological breakthrough that led to high yields in small light packages charcteristic of all U.S. missile warheads today. 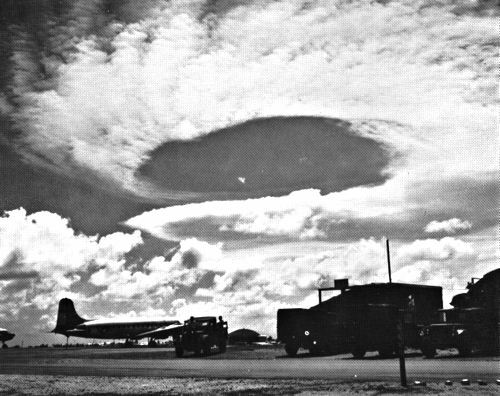 The extensive test schedule required the use not only of both atolls (Bikini and Enewetak) but Johnston Island also. 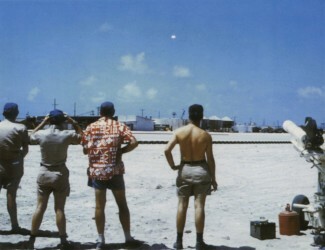 This series was the last to conduct atmospheric testing at Bikini and Enewetak atolls. Test names were taken from North American trees and shrubs. DOD/LASL test of a W-25 air defense warhead in a high altitude balloon-lofted shot for ABM development work. The device weighed 218 lb, the complete balloon payload was 762 lb. 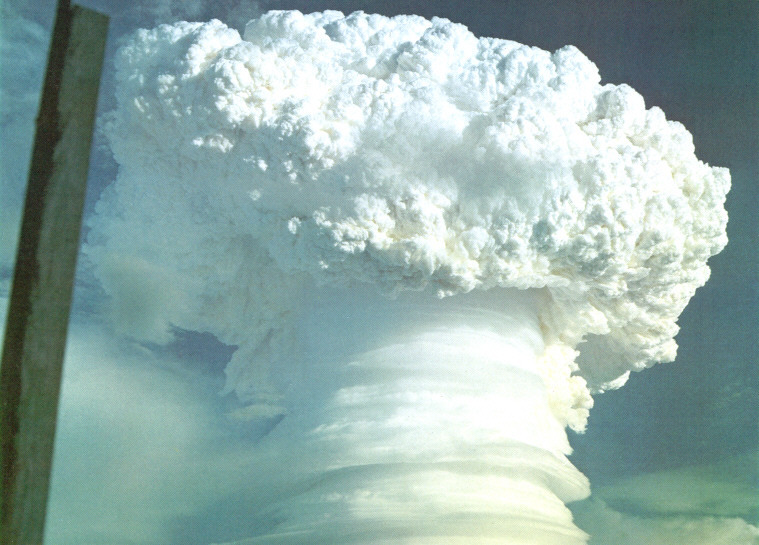 LASL test of a MK-43 primary in a thermonuclear system mockup. Similar to to the Elder device. Predicted yield 13-14 kt. The Cactus device primary weighed 110.3 lb (50 kg). The over all device weighed 1432 lb. and had a width of 18 inches and a length of 69 inches. The device was detonated 596 feet southwest of the Redwing Lacrosse crater. The Cactus crater had a diameter of 346 feet, and a maximum depth of 37.2 feet (with a 8-14 foot lip). 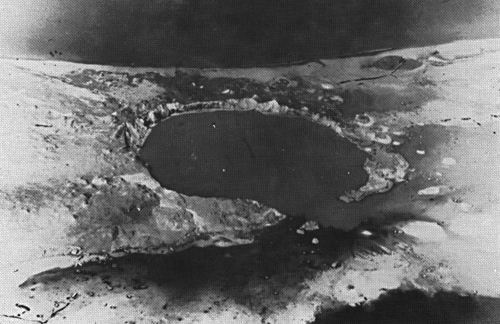 In 1979-1980 this crater was used as a burial pit to inter 110,000 cubic yards of radioactive soil scraped from the various contaminated Enewetak Atoll islands. This was a LASL developmental test of a "clean" TX-46 warhead design. 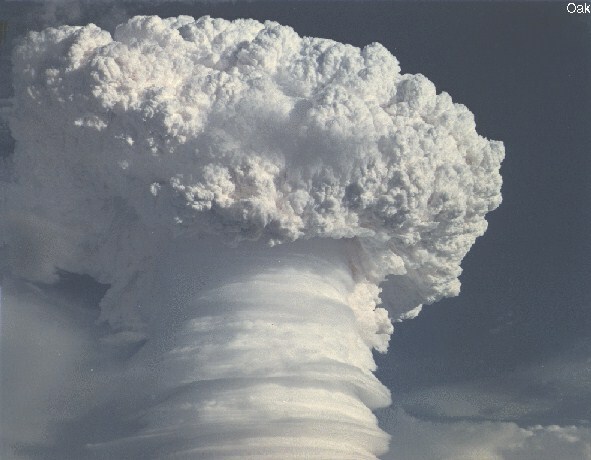 The predicted yield was 2.5 Mt, of which only 200 kt was expected to be fission (8%). The test was a fizzle with only low level thermonuclear burning detected in the second stage. Yellowwood was similar to Hardtack I Butternut, which demonstrated the primary with a yield of 81 kt. A modified Yellowwood design was successfully refired in Hardtack I Oak (below). This system was eventually developed into the W-53 9 Mt Titan-II warhead and the B-53 strategic bomb. The shot barge for Yellowwood was ballasted with 225 tons of silica sand, in an attempt to reduce biosphere exposure to strontium-90. It was hoped that chemically inert strontium silicate would be formed. 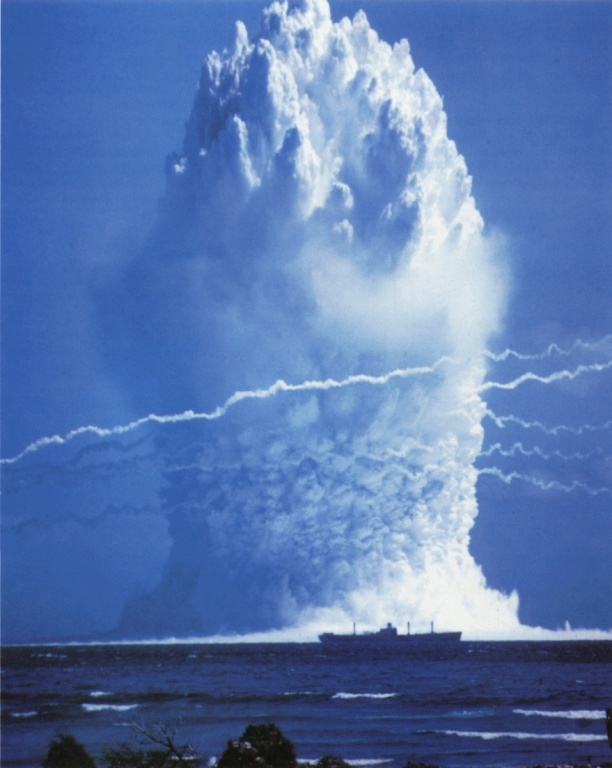 Umbrella was a DOD sponsored weapons effects test for a medium depth underwater explosion. 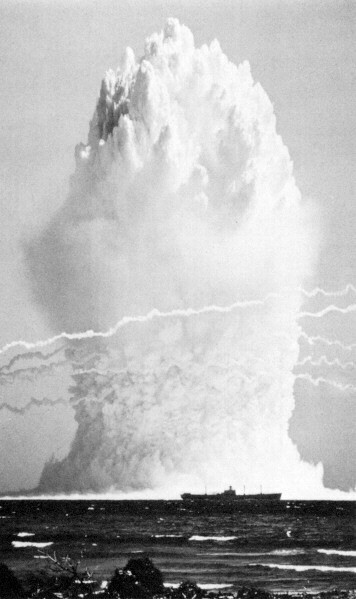 A Mk-7 bomb was used for the test (30 inches in diameter, 54 inches long, device weight 825 lb.) in a heavy pressure vessel (total weight 7000 lb.). Very similar to the Wahoo device. The device was detonated on the lagoon bottom NNE of Mut (Henry) Island. An underwater crater 3000 feet across and 20 feet deep was produced. Prototype test of the LASL designed TX-46 system. Similar to the devices tested in Butternut (an 81 kt primary test) and Yellowwood (a fizzle). The second stage was beefed up after the Yellowwood failure, this was also a standard "dirty" configuration (in contrast to the "clean" version fired in Yellowwood). This test exceeded the predicted yield of 7.5 Mt. The fission yield was predicted to be 4 Mt, actual fission yield was 5 Mt. This is one of the largest devices ever tested by the U.S. (6th largest U.S. test). The test was conducted in very shallow water (12 feet). The device was horizontal on the barge, with the axis 3 feet above the barge deck, which was in turn 5.6 feet above the water line. The barge weighed 223 tons and was unballasted to provide a shallow draft. The subsurface crater produced was 5740 feet diameter and 204 feet deep. The test device was 37 inches in diameter and 100.5 inches long, and weighed 6113 lb. This design was later developed into the 9 Mt W/Mk-53 warhead deployed on the Titan II missile and the Mk-53 strategic bomb. This last version remained in active service until early 1997, making it the oldest and highest yield weapon in the U.S. stockpile (it is not clear whether it is still being held in the reserve stockpile, or whether it has slated for dismantlement). 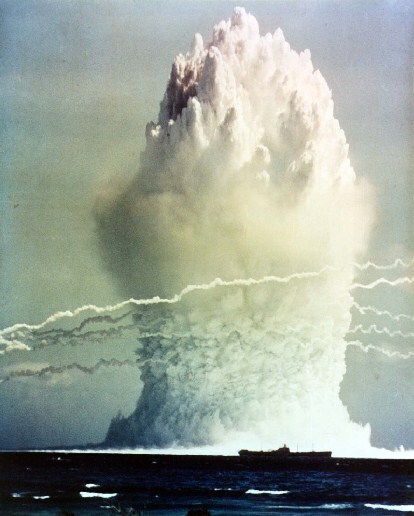 This shot, the last Bikini atmospheric test, was an exploratory shot by UCRL attempting to dramatically reduce the size and weight of a nominally 1 megaton warhead. Alumni of the UCRL weapons program from this period have described this test as the "most radical UCRL shot" and an "entirely new concept". This led eventually to the development of the W-47 Polaris missile warhead which considerably reduced the size of megaton class warheads. The degree of novelty can be judged by the range of predicted yields 0.2 kt to 60 kt, i.e. the possibility of complete failure of the boosted primary and the secondary stage was considered possible (0.2 kt is approximately the yield of a boosted primary that fails to boost). The test was a complete success. The test device had a diameter of 14.4 inches, and a length of 15.3 inches. It weighed 167.5 lb. Below is the Juniper shot in the background. 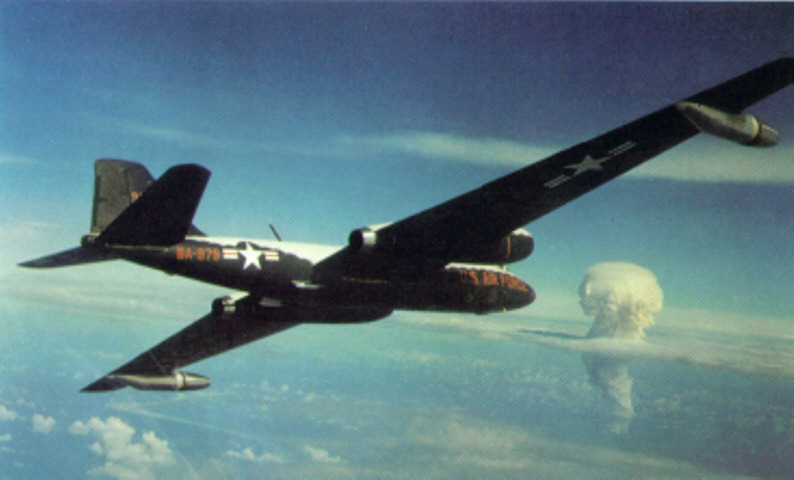 A reconnaissance aircraft is in the foreground. Wahoo 1:30 16-May-58 Enewetak Underwater -500 9 (-) DOD/LASL WE Mk-7 deep water effects test, water depth 3200 ft.